WISSBLUE Waterproof Swimming Pool Lights Floating Underwater LED Pond Lights for Hot Tub, Baby Bathtub, Fountain, Pool Party or Pond Decorations - 7 Modes, Waterproof, Battery Operated | Fountain City Art Ctr. The floating light could move around in the tub and emit colorful light spots, brilliant addition to make showering a bit more interesting and relaxing for both kids and adults. It can be applied for swimming pools, bathroom, fountain, aquarium, parks, adding a disco touch or a festival atmosphere to your occasion. The light should be floating on water rather than submerging under the water! To turn off the light, just press the button and holds for 3 seconds. 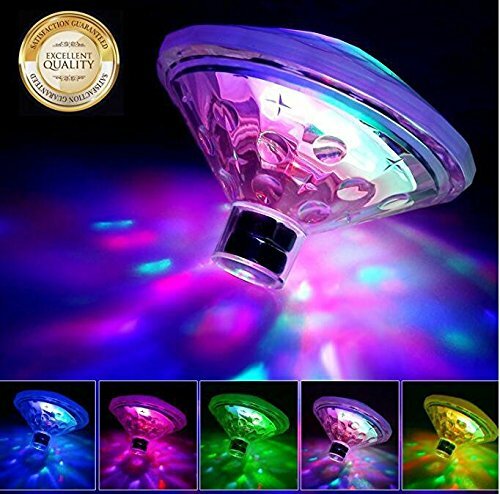 ✅【Wonderful Light Show】-- The floating pool light functions with 7 different mods, glowing, flashing, color-changing, the easiest way to create a magic light show and add a disco touch to your swimming pool party, or a fountain, pond, aquarium, etc. ✅【Waterproof Design】-- Our LED pool light has a clear waterproof ring along the seal of the upper shell to prevent water coming in. The waterproof rating up to IP68. Note: Please let it float rather than submerge it underwater. ✅【Wide Application】-- It can move around in the hot tub and project colorful light spots, making showering more interesting for kids and more relaxing for adults.Very nice decoration for party, living room, bathroom, bathtub, swimming pool, bar, etc. ✅【Easy to Use】-- Remove the upper dome, release the screw of the battery cover and install 3*AAA batteries (not included) in the correct polarity ends, tighten the screw, at last close the dome and press the button to turn on/off the unit or change its modes. ✅【Satisfaction Guaranteed】-- 24/7 email support,6 Month Warranty and 30-Day Return Guarantee - WissBlue Value Your Satisfaction. If you have any questions about this product by WISSBLUE, contact us by completing and submitting the form below. If you are looking for a specif part number, please include it with your message.